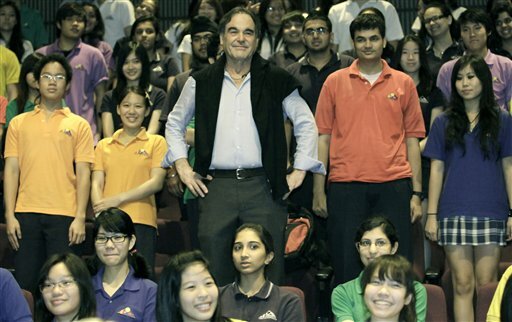 Stone was in Bangkok to talk about filmmaking and peace as part of a series of talks facilitated by the Vienna-based International Peace Foundation. Stone said Monday he thought it was “a good thing” to revisit the JFK assassination. But he came under fire from the historians and film reviewers who contended Stone had fudged facts, invented characters and elevated speculation to truth to support his burning belief that the killing was a high-level conspiracy. Stone is famous for several other movies, including the Vietnam War films “Born on the Fourth of July” and “Platoon,” and “World Trade Center,” about two policemen buried in the rubble of the twin towers after the Sept. 11 attacks. “Platoon” won four Oscars, including best picture and best director.